Regimental Sergeant Major Gilbert Furness died at Camp Zachary Taylor in Louisville, Kentucky on October 10, 1918. Gilbert Furness was the first Mandan soldier to make the supreme sacrifice in military service during World War I. Ironically, he fell victim to broncho pneumonia during the worldwide influenza pandemic in 1918-1919. Gilbert Furness was born to Lucy (Miller) and Anthony William Furness in Montpelier, Vermont on April 30, 1898. His middle name was a tribute to his maternal grandmother Theresa Maria Sessions. Both parents were from New York, but they resided in Vermont immediately before their move to North Dakota in 1903. His father Anthony managed a flour mill, became deputy Morton County treasurer and later served as fulltime Secretary to the Mandan Chamber of Commerce. The family resided at 400 7th Avenue NW. Gilbert graduated from Mandan High School in 1916 as the class valedictorian. Gilbert was the oldest of four (4) sons. His brothers included Richard (b. 1900), William (b. 1902) and Bruce (b. 1904). Heroism apparently ran in the family. His brother Richard was awarded the "Eagle Scout Badge of the National Court of Honor" by the Boy Scouts of America, the first to any boy in North Dakota. At the time in March 1916, less than 100 of the badges had been awarded nationwide. The honor was bestowed upon him for "seeing a playmate who could not swim being carried off into deep water in the Heart River by a swift current plunged into the stream as the boy was going down for the third time and saved his life." Richard was 14 years old at the time of the rescue. In October 1918, the world struggled with a world war in the midst of an influenza pandemic. 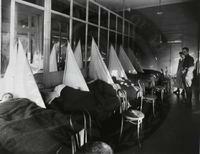 American soldiers, stationed in military camps across the United States, were among the earliest victims of the pandemic. As the disease spread, military hospitals, both in the United States and abroad, quickly overflowed with influenza patients. However Germany eventually collapsed and peace was declared on November 11th. 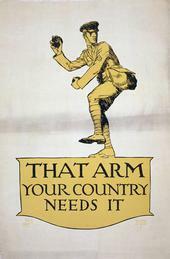 Nine million people, 340,000 of them Americans, had died during the war. Horrific as this number was, it would be dwarfed by the fifty million who would die in the influenza pandemic including an estimated 675,000 Americans. Gilbert had enlisted at Minneapolis, Minnesota on January 20, 1918 and was sent to Jefferson Barracks, Missouri. He served as a clerk in Battery A, 1st Brgade, Field Artillery Replacement Draft at Camp Zachary Taylor. His intelligence and dedication to duty is apparent by the fact that he was rapidly promoted from private to Corporal to Regimental Sergeant Major on September 20, 1918 in a span of only eight months. In May 1919, his fellow veterans in the process of establishing an American Legion post in Mandan, voted to name it after him. Upon hearing of the honor, his former commander sent a letter dated June 29, 1919 to post commander Hugo Rendon from his then current billet at the Headquarters of the Army's 1st Division in Montebauer, Germany. I have just received a newspaper clipping telling of the organization of the Gilbert S. Furness Post, American Legion in Mandan. I am writing this to tell you how glad I am that the new post was named after this gallant boy. Gilbert Furness was a splendid type of American manhood, who had in his heart a great love of country and devotion to duty and exemplified in his everyday life the high ideals for which the Legion stands. By thus perpetuating his name the new post has paid a fitting tribute to his memory. I wish very much to be enrolled among the new members. He was 20 years old at his death and is buried beside his parents in Union Cemetery in Mandan. Notes: Gilbert S. Furness should not be confused with his uncle Gilbert B. Furness who was a physician in Mandan and surgeon for the NPRR in the early 1900s and the older brother to Anthony (A.W.) Furness. Dr. Furness and his wife Grace had four daughters, Margaret, Dorothy, Grace and Marion all born in North Dakota. William Furness, the grandfather to Gilbert S. Furness also resided with Dr. Furness and his family in Mandan. The Society wishes to thank Audrey (Furness) Zahm for reviewing the content of her uncle's biography for accuracy.